What a busy weekend! C and I don't know where the time went. Actually, we do. We were very busy. I'll jump right into Saturday as I was working until the late hours of Friday night. But now that I think about it, C was up to stuff on Friday night. He took Mark to Chipotle to use a buy one get one burrito coupon because as I have told you here I am in no way a fan of the food from the south of the border. They then returned home to watch a movie. 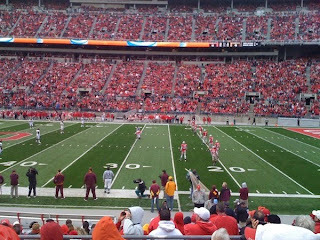 Saturday I went with my other family (read: "the Guenthers") to the Buckeyes Game and Dinner to celebrate Christine's birthday. This also doubled as a Girl Scout Troop 1502 reunion. 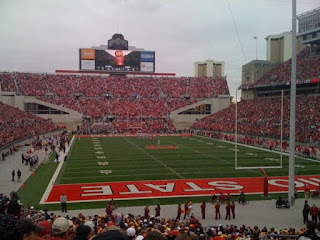 The first part of the game seemed to drag on and on and on, but once we changed seats things started to pick up. For all you Buckeyes fans, Christine and my changing seats is to thank for the sudden onslaught of scoring and interceptions and general un-buckeye-like playing. You're welcome. After the semi-rainy, semi-cold, but very enjoyable game we headed to German Village. The Guenther's churched while I didn't church. I spent my time picking up the latest book by Celia Rivenbark. It is my new goal to not fall off the equipment from laughter while reading it at the Y. After church and not-church we met up for dinner at G. Michaels. It was d e l i c i o u s! I had a yummy salad with walnuts and pears (always a winner when there's fruit on my salad!) and walleye (I think). Even my coke tasted better than the coke at a regular eatery. I'm going to have to drag C up there some time for dinner so I can try more d e l i c i o u s menu items. Where does that put us now? Oh yes, once we returned back to Lancaster C and I watched an oldie but goodie chick flick that he had never seen. Someone Like You is a classic in my book. I could watch it all day. However, I'm a little hesitant to watch these things with him. Ever since he was in the room with me when Gossip Girl was on, I feel very self conscience about what I watch when he's around. Granted if he's not home I have no qualms about watching GG or any other mind numbing chick show. I only think less of myself when he's around. Despite any qualms I may have had, C enjoyed the movie (at least that's what he told me). Sunday afternoon we headed to the Fairfield County Airport for a p0t luck and plane rides. We have some very generous pilots at church who took roughly 7 flights around Fairfield County. Mark, C, and I were in the last group, but did not get to go because we ran out of time. The Gerkins generously offered to take us up some other time. We hope to do that in the near future when C's parents are here. Even though we didn't get to go on a ride we still had a great time. We watched sky divers, threw the football (the boys), and socialized. We really enjoyed the afternoon! We're really looking forward to next weekend. I've got some plans up my sleeve that I think C will really like.